As an experiment, I didn’t take the Linux laptop on my recent Embedded Systems Conference trip. Instead, I relied on the trusty Galaxy 8+ superphone for email and web access. I was able to plug my robotic skull into the hotel room big-screen TV, via an HDMI cable for a few last-minute tweaks before the show. While most modern hotel rooms have an HDMI-capable TV, there’s always a chance they won’t. If you need to do real work, you’d be out of luck. It’s also hard to do any development or programming on the skull at a coffee shop. Sure, they sometimes furnish AC outlets, I have yet to see personal HDMI monitors at each table. 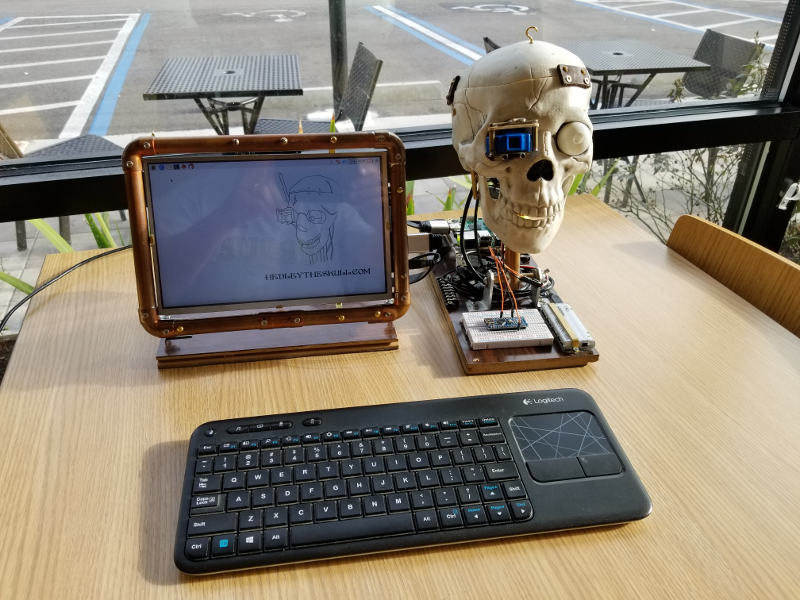 For a true “skull top computer,” a small portable monitor is the way to go. This applies to any project using a Raspberry Pi or any other nano-Linux device, especially if you want to do your development work away from your office or lab. I’m on a one-man campaign to integrate nano-Linux machines into physical computing gadgets. You can buy small monitors fairly cheaply. Amazon has one for about $100. They also have a monitor model for use with just a Raspberry Pi for a little more money. The Pi mounts on the back. 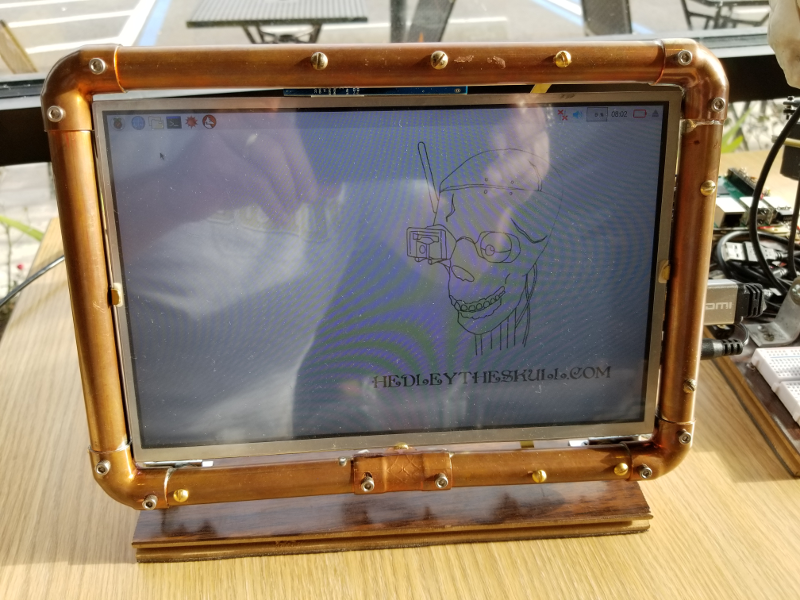 I covered using a bare LCD panel and driver board with the robot’s Raspberry Pi in a recent article. You could always schlep the loose parts around although that gets old very quickly. Impromptu or pub-based demos are definitely the domain of a nice looking self-contained, portable monitor. I ended up building my monitor to match the steampunk theme of the skull. 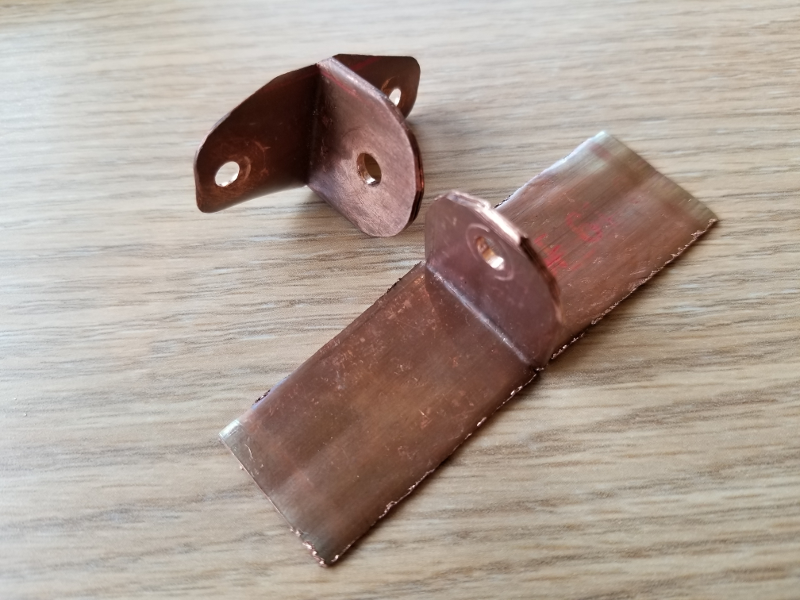 The 1/2-inch copper tubing is great for the structural frame because it is easy to machine and solder. Soldering the tubing together creates a strong platform for attaching the display, driver board and hinge at the bottom. Cap screws helped finish the look while keeping it simple. The LCD frame was built using the usual 3/16-inch diameter brass tubing and 1/16-inch X 1/4-inch brass flat stock. You can cut the tubing with a cheapo pipe cutter. The flat stock is easily sized with aviation tin snips. Using brass fits the steampunk theme perfectly and is exceedingly easy to solder. I’ve noticed that the hobby shops are not stocking it in 3 foot long lengths as much as they used to. Sourcing an online supplier probably needs to go on the to-do list. I also built the driver board brace from brass tubing and flat stock. 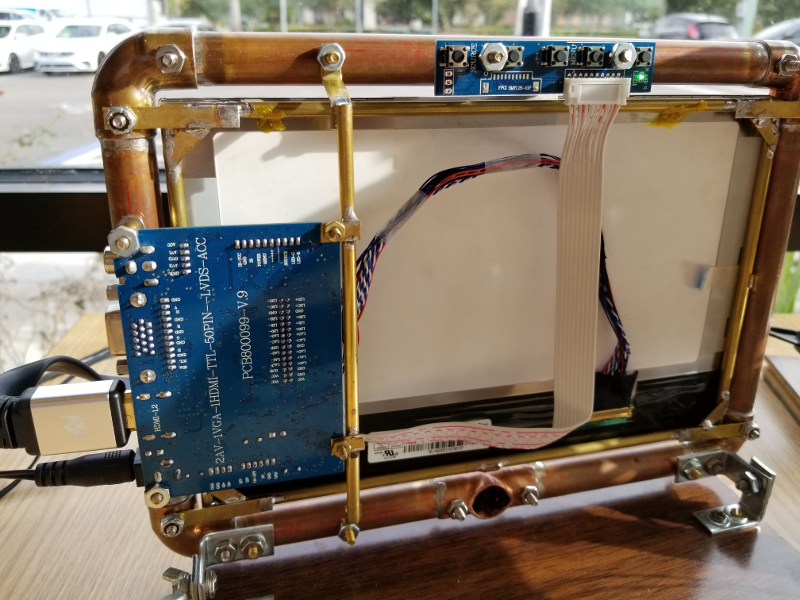 The initial plan was to use copper tubing and elbows to support the display on a swiveling arm. The arm would bolt to the skull’s base and stick out one side. The mock-up elbows didn’t rotate very well and the horizontal part of the arm needed to be pretty long and potentially could cause the skull to tip over from the weight. 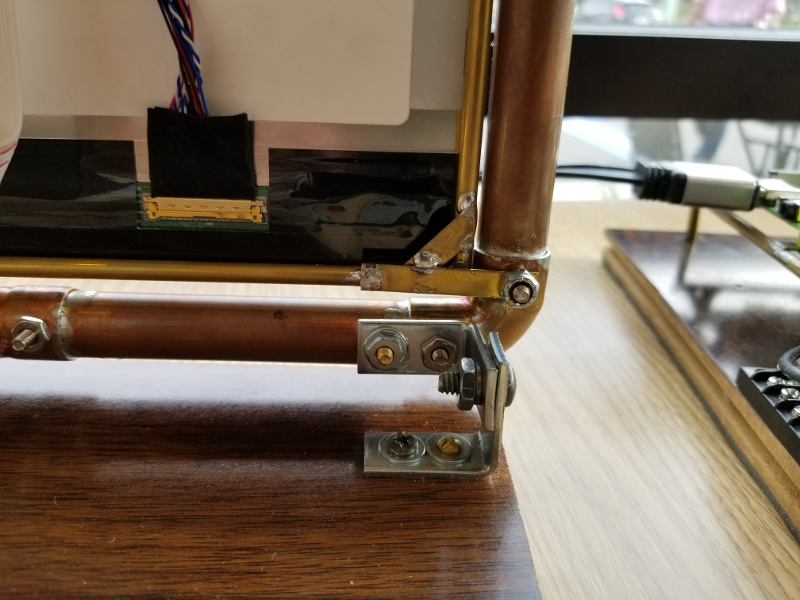 I also considered a center mounting point, using flattened copper tubing as the tilt hinge for the display. The copper brackets proved too flimsy so I just ended up abandoning the whole arm-mounted display approach. Instead, I sourced four steel angle brackets from Ace Hardware and used them at the bottom ends of the frame for the display pivot. This mod made the build very rugged and solid feeling. I used a piece of composite wood flooring as the mounting base for the monitor, similar to what I used for the skull. The tongue-and-groove flooring lips were easily removed with a saber saw. The bottom is even covered with rubber padding, so the monitor doesn’t slide around or scratch a table surface. I also turned the skull around 180 degrees on the base so the Raspberry Pi is now at the rear. I prefer the monitor on the left side of the skull and making this change made all the cables line up nicely. Putting the board at the back gives the whole rig a cleaner look, as well. Using the monitor with the skull is now a pleasure. It takes about two minutes to set up and boot. Everything fits neatly into Hedley’s travel case. I’ll likely build a copper tubing base to use instead of the wooden one. Copper tubing is very steampunk and I think it would look great, with a slight reduction in weight. The 15,000 mAh battery mounting is still up in the air as to whether it would work better attached to the monitor or robot base. I need to pick up several car charger plugs to bring the 12-volts of the battery down to 5-volts for powering the Pi, Arduinos and JeVois sensor. I’m planning to hack the devices out of their cases and figure out a convenient mounting so I can run the various cables to their USB sockets. The charger boards will be hardwired into a connector that goes between the battery and the 12-volt display driver board input. I think I can build a back cover out of that corrugated plastic foam board, used for political candidate yard signs. The material is easily cut with an Exacto knife, can be hot glued together and painted with a decorative themed design and color.